It seems that badassary is not going to end this year until Ajay Devgan and Emraan Hashmi starrer 'Baadshaho' is released. First, it was Ajay Devgan’s look which went viral on the internet and now it’s Emraan Hashmi’s who is in all together a new avatar. The posters and looks releasing one after the other will leave you wonderstruck. 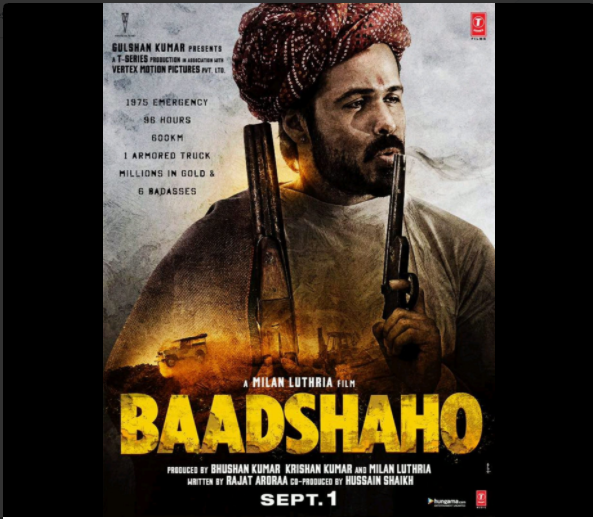 Clad in Rajasthani costume, Emraan is seen blowing a pistol and yes, he looks like a badass never seen before. Earlier while releasing the Baadshaho poster, Ajay had captioned his tweet- "1975 EMERGENCY...96 hours...600km...1 Armored Truck...Millions in Gold & 6 BADASSES. Baadshaho Sandstorm Is Coming!" It seems we going to witness the Emergency period when Indira Gandhi had declared a 2-year emergency across India and, it is evident through the poster that this film is going to be thrill filled with lots of action on highways and the audience would be blown by gun shots and bombs. Ajay Devgan had earlier taken to his Twitter account revealing his 'Baadshaho' look captioning it- “The badass in the bandana!” It seems Ajay Devgan is surely the true action hero of India. Now that Ajay and Emraan’s look have been revealed, fans would be desperately waiting for the looks of other cast of the team- Ileana D' Cruz, Esha Gupta and Vidyut Jammwal. Written by Ajay Arora and directed by Milan Luthria, 'Baadshaho' will hit the cinemas on September 01.